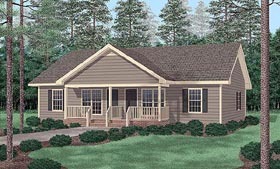 A compact duplex designed for maximum economy, the Hannah has a charming traditional look that is right at home in many residential subdivisions. Features of the Hannah include: Sheltered back porch accessible from the kitchen. Washer/dryer closet reduces laundry noise and provides extra storage for housekeeping supplies. Full bath for main living area and second bedroom Bedroom 1 has a private full bath. Living area includes space for informal dining. Wide hallways make this plan readily adaptable for wheelchair accessibility. 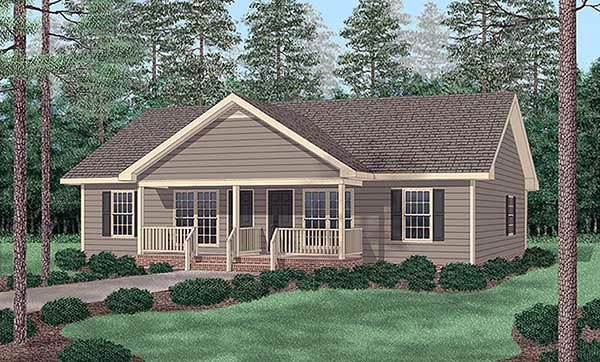 The Hannah's curb-appeal and its suitability for budding families, single professionals, and retired empty-nesters make this duplex worth considering for your next building project. Question: I have a few questions regarding the above plan. 1. Where is there a linen closet. 2. What is the area by the second bedroom by the closet that is X out. 3. Can the plans be altered to allow for 2x6 construction 4 Does the plans show all electrical and plumbing. 5. If we build this on a basement does the stairs down by the wall in the living room 6. Where can the kitchen table and chairs go as there no room in the Kitchen. 7. Do you have plans for a little bit bigger than this one. Thanks for your info regarding the above. Question: If i order the pdf, is there a time limit to building? Answer: No not on our end but if you wait too long the code the plans are drawn to could change.